Explore features and benefits or download Screenswift to start creating your own flash screensaver. Screenswift is free for personal use and $69.95 for commercial use. 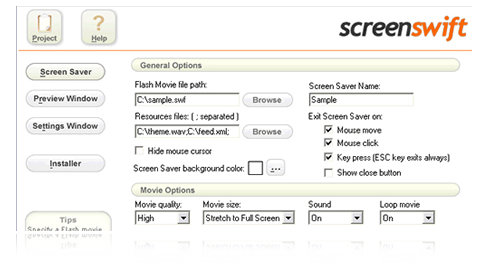 Screenswift is the powerful, easy to use flash screensaver tool for Windows. Dive in & explore the features & benefits in the offering. Take a closer look at the application and be amazed by the ease of use and simplicity. Learn how easy it is to create your first screensaver. Screenswift pricing begins as low as $69.95. Buy now from our 100% secure online payment gateway. "Screenswift is a good, solid, inexpensive way to create screensaver from your flash files"